If it were not for deaf boxer puppy Nitro, Deaf Dogs Rock would not exist. His adoption by Christina and Chris Lee in 2010 introduced them to the world of deaf dogs and sparked an interest in helping other deaf dogs and their families. 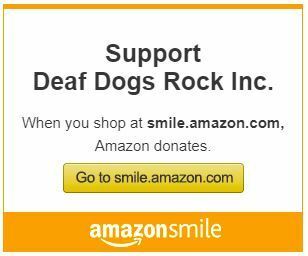 This spark would spread throughout the world and grow to an active community of 65,000+ people who believe that Deaf Dogs Hear with Their Hearts. Sadly Nitro passed away in November of 2018. We should all strive to have the blessing of leaving behind a legacy as he did. In Nitro’s honor, we have established Nitro’s Fund – a specific fund dedicated to supporting the needs of deaf boxers and their families. Nitro was the ultimate ambassador for deaf dogs, and deaf boxers particularly. While all breeds are special, for many the boxer holds a position near and dear to their heart. Their spirit, playfulness, joy, and perpetual youth are precious. Enter any amount below, then press continue to view all form fields. Is this donation in honor of a special dog? If so, tell us about them. Or, tell us anything you'd like us to know! Use this link to upload an image if you'd like. Make a donation to a fund specifically supporting deaf boxers. Have the donation be in honor of your dog. Upload a photo of your pup. Share a story – we’ll compile them and share. Dogs Helped by Nitro’s Fund – You Can Make a Difference! Thank you Lora and Marlin!